Discover these and numerous other profound and fascinating truths about your personal surroundings. 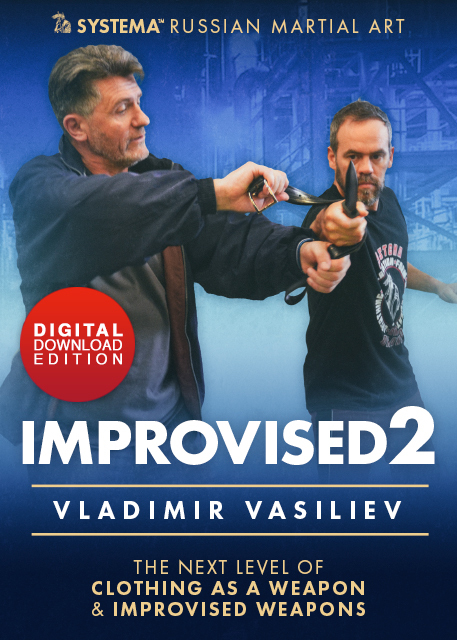 IMPROVISED 2 presents new concepts, drills and demos, previously not covered in Clothing as a Weapon and Improvised Weapons videos. Discover the concealed power of your jacket and shirt against holds and stabs, to choke and shield, to change appearance and to rescue yourself and others from real threats. Study the inescapable restrain of a belt, unexpected functionality of your keys and cap, damaging adaptability of your briefcase or bag, multi-level application of a book and umbrella. Expand your thinking and awareness. See the non-apparent potential of things around you. Integrate your perception of danger and space. Take your training to the next level. This video is brilliant! The exercises with clothing are so useful, especially with a jacket, it is always on you and on your opponent. I actually tried many drills, very practical and completely adaptable. Well done, Vladimir! 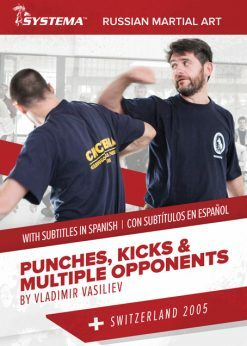 As Vladimir Vasiliev’s student for over ten years and an instructor at Systema HQ Toronto, I try to participate in all Systema seminars and camps. IMPROVISED 2 (IW2) is based on one such seminar held in 2016. Back then, I took a bunch of notes and wanted to compare them with the video. My impression – it covered, in great detail, everything I had noted and some more, so watching it was an excellent refresher. The video starts with an overview of the basics – things that one needs to keep in mind when working with “weaponized” objects. For example, a regular pencil in one’s hand at night can be easily mistaken for a weapon and provoke an attack. Among other things, Vladimir also explains how objects tend to create tension and even immobilize their bearer – something that any practitioner must learn to avoid. When practicing martial arts, one normally wears some sort of sports clothes or a uniform. 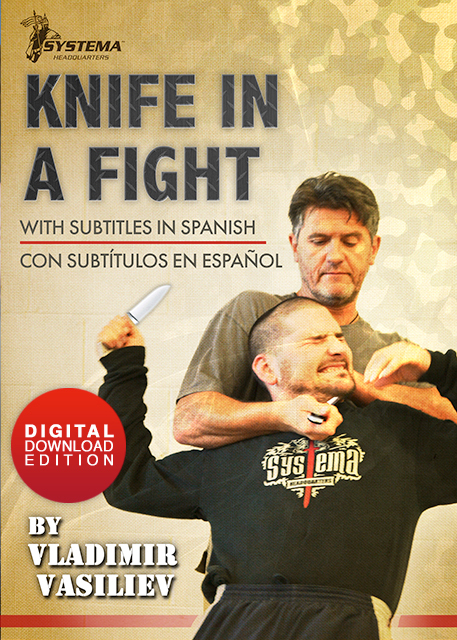 As well, in traditional martial arts students practice defense techniques against a weapon that’s already drawn and poised for attack. Of course, real life is different – people wear seasonal clothes that are not necessarily all that comfortable for physical activity; and any attack with a weapon typically involves taking the weapon out of its hiding place (from under the belt, out of a pocket, etc.) The warm-up in the video specifically focuses on real life; it teaches students to move on the floor, go down and get up in their outside clothes while hiding and taking out a weapon. Another important skill covered by the warm-up is how to avoid resisting and pulling back when grabbed by one’s clothes, but rather to follow attacker’s direction and then escape with much less effort. Lastly, the warm-up has some unique exercises for isolating and localizing tension in one’s body so that a weapon or actions of others do not lock you up. After the warm-up, the viewer is offered an in-depth review of, and practice with multiple improvised weapons, such as keys, pocket change, a book, pencil, magazine rolled into a tube, baseball cap, umbrella, walking stick, briefcase, handbag, etc. The object application section is followed by extensive work with clothing such as jacket and t-shirt, which complements the first part very nicely making it a two-in-one type of deal. 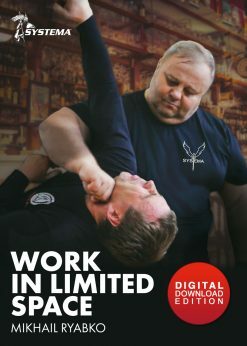 Unlike training videos for other martial arts, IW2 is not focused on drills or fixed techniques. Instead, it reviews each object’s properties for attack and/or defense and then covers the key principles of using the object, such as how to hold it, how to strike, and which parts of the body to strike. After that, students are asked to implement the principles in practice. As a result, they don’t mechanically learn standard moves but are encouraged to react naturally to a changing situation, think on their feet, improvise, and move continuously. 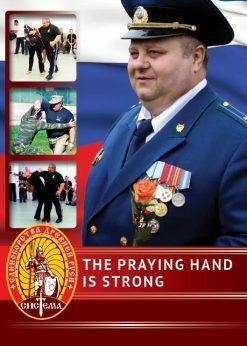 For instance, Vladimir demonstrated how a book with hard cover can be placed as a shield under one’s belt to protect the stomach against a knife; how it should be held in one’s hand; how it can be thrown toward an attacker; and how its edges can be utilized to cause a lot of damage. Similarly, house or car keys can be both thrown at the attacker for distraction and used to apply a point or cutting pressure on the body very effectively. A belt can be used to strike like a stick or like a whip, choke, take down, tie a person up with no chance of escape, or to remove an object from the attacker’s grip. It is truly fascinating to see Vladimir show how one person with a belt can simultaneously defend against three attackers all armed with knives. As an example of a basic principle, the video explains counter-movement (that’s when the non-throwing arm moves toward you and away from the opponent to meet the throwing arm at the elbow causing the throwing arm to flex and catapult whatever was in it toward the target). When using this principle, object throwing becomes truly unexpected and shocking to the assailant. After covering objects, the video naturally transitions to clothing and its use to escape, conceal, or shield from an attack, as well as its properties as a weapon. Notably, this involves not only one’s own clothes, but also those of the opponents. That’s to be expected, as clothes are almost always available and can be readily used for combat. IW2 goes on to cover basic but very important skills such as the ability to take your jacket off (even without using your arms) and put it back on, as well as altering your appearance by exchanging clothes with another person or turning your jacket inside out on the move (standing up, sitting or lying on the floor, or going down and up). The skills are great for escapes, for example to quickly get out of a jacket when grabbed by the sleeves or when somebody steps on it while you are lying on the floor. Another major use of clothing is its use for protection. 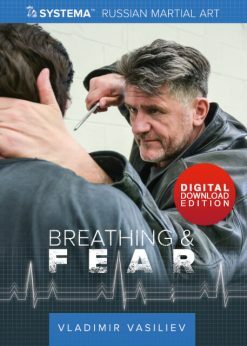 Vladimir shows how you can use a jacket or a t-shirt to protect your head and face (this is especially helpful if you are on the ground), stretch a side of the jacket to create a shield against a knife or a fist, or just to give yourself a direction and momentum for an escape). Furthermore, clothes can be rolled into a bundle or wrapped around an arm to be used against a knife or an attacking animal’s teeth. Finally, IW2 focuses on using clothes to attack – to take a person down by pulling on their top or by wrapping a jacket around their knees; to choke, to disorient the opponent by covering his eyes, and much more. An important point to note here is that the material is not stuck on just using clothing; students are encouraged to combine the use of strikes, kicks, locks, and holds, as well as movement, while taking advantage of theirs and opponent’s clothes. 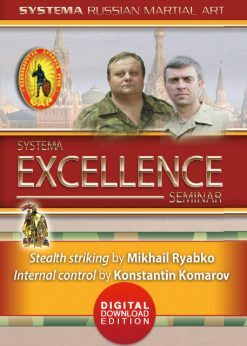 This brings me to my concluding point – when watching the video, it is clear where Systema (“The System” in Russian) got its name. 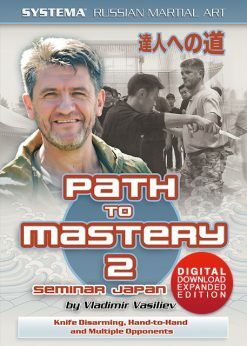 IMPROVISED 2 truly presents a systematic, comprehensive and consistent approach to teaching not only combat skills, but also essential skills used in daily life.